Eberlestock's H2 Gunrunner is a minimalist, lightweight rifle pack that's designed for hands-free hunting and quick access to your rifle. 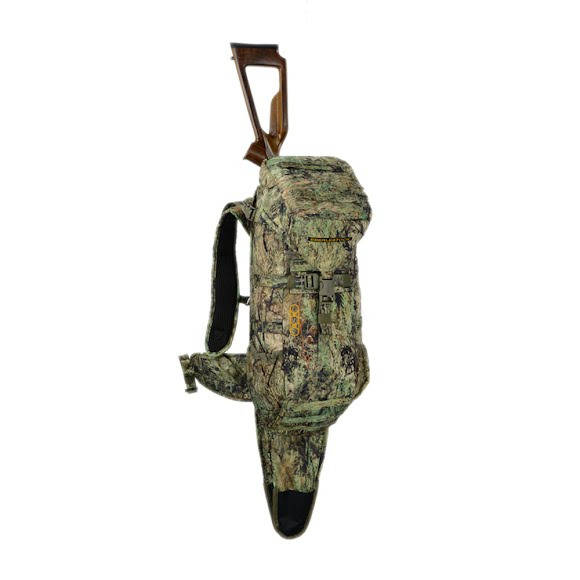 The top compartment is a good size for range finders, calls, etc., and the main compartment is sized for a day's worth of food and clothing. It is hydration compatible (hydration sold separately). Eberlestock &apos;s H2 Gunrunner is a minimalist, lightweight rifle pack that&apos;s designed for hands-free hunting and quick access to your rifle. The top compartment is a good size for range finders, calls, etc., and the main compartment is sized for a day&apos;s worth of food and clothing. It is hydration compatible (hydration sold separately). The pack has crossed vertical and horizontal compression straps, which are useful to grapple things to the pack, and a stowable waist belt for stabilizing the load when you&apos;re moving fast. The Gunrunner&apos;s scabbard folds and clips into the bottom of the pack when not in use, leaving the upper portion of the scabbard available as a large pocket. Dimensions 18" x 9.5" x 7.5"
Its everything i expected it to be. The quality and functionality is also great!